Pensacola State College presents “The Miracle of the Maafa: Understanding African Enslavement and Empowerment” by award-winning educator and author Chike Akua. The public is welcome to this free event at 6 p.m. Thursday, June 29, at Hagler Auditorium, Building 2, Room 252, on the Pensacola campus. Doors open at 5:30 p.m.
“The Miracle of the Maafa” is a deeply insightful presentation about the specific strategies used to exploit and enslave African people, how those tactics are still being used, and how African people can tap into their original cultural awareness. Akua focuses on the way African slavery has been explained in the past. He also provides a critical analysis of the nature of the European system of enslavement and its current remaining vestiges in America along with acts of African self-determination and resistance to overcome it. Often called an “educational revolutionary,” Akua is a sought-after speaker at colleges, universities and educational conferences. 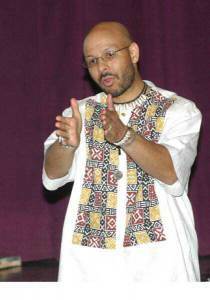 He is recognized as a leading authority on culturally relevant educational materials and instructional approaches. Described as empowering, insightful, provocative and enlightening, Akua’s presentation produces a life-transforming experience.